When mandolinist Avi Avital last came to Boston, he was greeted with the ardor accorded to a rock star [our review here]. He was soloist with the Venice Baroque Orchestra, and his playing bedazzled those who hadn’t heard of him. Just a year later, Avital is a much less well-guarded secret. His Bach album on DG has sold well, and his “Round the World” tour with accordion and percussion has been a big success, following on the heels of his eponymous CD. If you have any interest in the mandolin—apparently back in fashion—you know by now of the Israeli mandolinist who was in excellent form at Jordan Hall last Friday night under the auspices of the Celebrity Series of Boston. 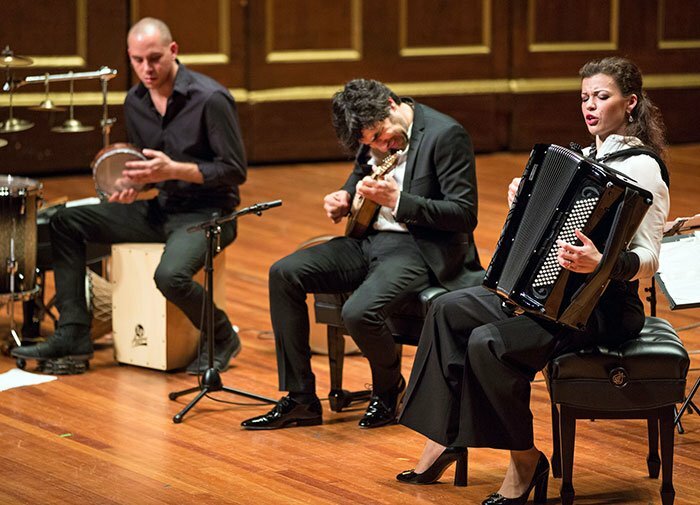 Even in the hands of an instrumental genius like Avital, the plucked instrument family generally succeeds more in a recital when it has kindred musicians adding texture, harmony, and adrenaline. If you can judge an instrumentalist by the company he/she keeps, then Avital has made some classy judgements about the musicians with whom he plays and records. This extensive tour’s entourage included the Latvian accordionist Ksenija Sidorova and the brilliant Israeli percussionist Itamar Doari.. In a DG interview, he opined that his role was to serve the audience the spiritual food they crave. Judging by the Jordan Hall (and YouTube) audiences, he has concocted programs that are satisfying, indeed. The program opened with the six famed Béla Bartók Romanian Folk Dances, here for mandolin and accordion. These “Romanian Folk Dances” are one of the program’s three groups of pieces so well-loved that they exist as universal transcriptions for nearly any combination of instruments. The mandolin captures the poignancy of these six pieces beautifully, especially when Avital takes the melody up an octave in repeats. Not a big accordion fan, I was surprised how well it worked in these various arrangements, played by piano in other Avital concerts. Sadiron plays with exceptional sensitivity. A traditional Turkish piece for mandolin and percussion, “Naciye Naciye,” featured a huge percussion solo. It’s clear that in matters of excitement, musicality and sheer boisterous, Avital had met his musical match in Itamar Doari. I would have been happy to have heard just the two of them all evening. The percussion (equipment) included an array of bells Doari had collected from all over the world, a frame-drum, tambourine, Middle Eastern hand percussions, and a cajón, n box-shaped Afro-Peruvian instrument on which Duoari often sat, playing the sides with the top of his palms and fingers. His enormous solo at the beginning was absolutely spellbinding, and he added a great deal of excitement throughout the program. As one piece ended, another would begin, seamlessly. Bach, Avital’s great passion, was next in the form of Sonata No. 6 in G Major, BWV 1019 (he even managed to sneak a little of the Chaconne into the Turkish piece). Violin music seems to work well on the mandolin, as did this piece (with accordion). As Avital pointed out in a BMInt interview [here], his first teacher in Israel was a renowned Russian violinist who ended up teaching mandolin as, when he moved to Avital’s town, there was already a violin teacher. After a traditional ethnic Bukhara/Israeli piece, “Mi Yetneni Of,” for mandolin and percussion (a frame drum), Sidorova played the Sarabande from Bach’s “Overture in the French style,” BVW 831, which segued into a traditional Bulgarian piece, “Bucimis” for mandolin and with a huge percussion solo, during which Doari had fun shaking the many small rattles strapped onto his ankle, The last piece before intermission was Three Miniatures Based on Georgian Folk Themes by Sulkhan Tsintsadze, the cellist in a famous Georgian string quartet. “Suliko,” the second movement featured tambourine and a Georgian frame drum, the doli. Ernest Bloch’s “Nigun” (melody) from “Baal Shem” (1923) for solo mandolin was one of the evening’s highlights. “Nigun” is the Suite’s second of three movements, in which Bloch explored the Jewish soul. It throbbed with intensity; Avital showed why he has such a tremendous reputation. Again, the higher range of the mandolin was piercingly emotional. Although this work was originally for violin and piano, Avital’s playing made a strong case for mandolin as an instrument that can project introspection as well as ecstatic spiritual feelings. He writes, “Bloch arranged his Suite for Violin and Orchestra, but in this performance the emphasis is on cultivating an immediate, intimate, personal connection with the Divine.” Done. Most impressive. Fritz Kreisler’s Praeludium and Allegro in the style of Pugnani (1905) for mandolin and accordion (Pugnani, by the way, never existed), was followed by another of the evening’s most beloved suites, Manuel de Falla’s Siete Canciones Populares Españolas, originally for mezzo-soprano and piano, which exists in arrangements for innumerable combinations (including two harps and voice by Carlos Salzedo). “Asturian,” the second movement (with accordion and mandolin) and “Nana” with its four descending notes, worked particularly well. The famous “Bachianas Brasilieras No. 5” was quite lovely, with a hand brush sweeping across the cajón. In the hands of Avital, the mandolin cuts through cultural boundaries, acting as a chameleon which takes on the national sound characteristics of whichever piece he plays. It’s unsurprising that the trio enjoyed a standing ovation, and that they did a wild encore by Avital himself (he seemed a bit shy when he announced it). Their CD table was mobbed. The charismatic, seemingly untiring Avital seems thrilled to be touring the globe with this program. I would have preferred a more intimate venue (a nightclub would have worked wonderfully), but Avital is, alas, too famous—and deservingly so—for that these days.